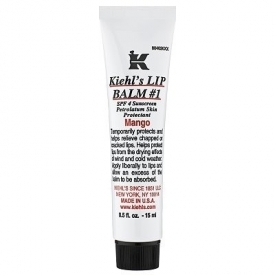 Temporarily protects and helps relieve chapped or cracked lips. This formula imparts a slight hint of color and protects lips from the drying effects of wind and cold weather. SPF15 sunscreen provides UVA and UVB protection. - Hue 30G is a light golden color with peach tones, similar to Golden Berry Lip Gloss. Hue 58B is a sheer lip gloss with cooler red tones, similar to Black Raspberry Lip Gloss. Apply liberally to lips, and allow excess to be absorbed. Petrolanum, Squalane, lanolin, Alcloxa, Prunus Amygdalus Dulcis Oil, Gossypium Seed Oil, Triticum Vulgare Germ Oil, Allantoin, Aloe Bardensis, Ricinus Communis Seed Oil, Cholesterol, Propylparaben, Butylparaben, Retinyl Palmitate, Tocopherol. A deeply hydrating balm in various wonderful flavours. A little expensive compared to family brands. A delicious balm that comes in various flavours (such as mango, vanilla or coconut) or natural. Hydrates deeply and is just gorgeous. "A deeply hydrating balm in various wonderful flavours."